Featuring 276 elegantly designed guestrooms, this hotel is conveniently situated in the Itaewon shopping district. 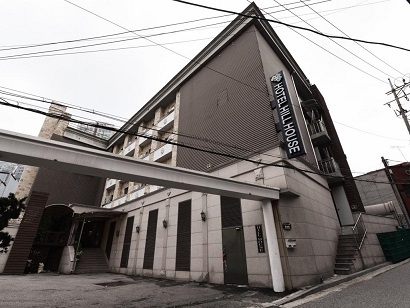 Capital Itaewon Hotel is 24km from the Incheon International Airport and five kilometers from the city center. The 5-star hotel is also a half an hour drive from Coex Trade Center and a five-minute drive from tourist attractions like Gyeongbok Palace, Duksoo Palace, Dongdaemoon, Namdaemoon, and Myung-dong. Offering beautiful views of Mount Kwanak and the Han River, the on-site restaurant serves Western, Korean, Japanese, and Chinese fusion cuisine. With its great location in the Itaewon district, Capital Itaewon Hotel is an ideal choice for travelers who love to shop and want to be close to major tourist attractions. 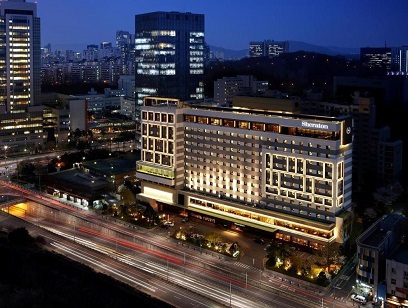 Sheraton Seoul Palace Gangnam Hotel blends attentive care with modern convenience. The rooms here are well appointed and cozy. The staff are attentive to the needs of the guests, and the location is ideal for excursions into Seoul. It is located in an interesting part of town, full of streets that typify the soul of South Korea. What really marks this hotel out from the rest are the staff. They will go out of their way to assure your stay in Seoul is pleasurable. 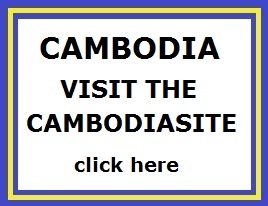 They�ll tell you where to go for a great meal and some excitement. To continue with your reservation at Sheraton Seoul Palace Gangnam Hotel, please enter your arrival and departure dates into our secure online form. Offering numerous facilities, the 5-star Grand Ambassador Seoul caters to both business and leisure travelers alike. Satellite television, high-speed Wi-Fi, air-conditioners, and voicemail are among the list of amenities inside each of the guestrooms. The luxury hotel boasts six dining venues including Caf� de Chef and Kings. After sampling local and international cuisine, sip cocktails or mocktails at the relaxing onsite bar. The hotel also boasts 11 meeting rooms and other business facilities for its corporate travelers. Explore the famous Itaewon shopping district nearby, or spend the day roaming around the Dongdaemun and Namdaemun Markets. After a long day of walking around the city or attending meetings, take a dip in the indoor pool or rejuvenate yourself at the hydrocenter. 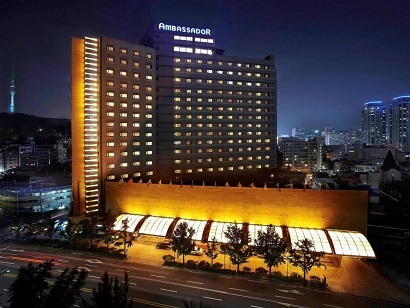 With numerous facilities on hand, the Grand Ambassador Seoul is ideal for business and leisure travelers. Decorated in traditional Korean style with a splash of Western modern influence, the 303 rooms here are good for any traveler seeking mid-range lodging. The location is a primary reason to choose President Hotel as it is within a stone�s throw of City Hall and major metro and rail stations. There are ancient palaces, financial institutions, as well as business and shopping streets nearby. So whether on business or visiting for tourism, the city is literally at one�s fingertips. The rooms on the higher floors have astonishing views of the vibrant downtown Seoul. If convenience of location is an important factor when choosing a hotel, this one is difficult to beat. President Hotel can be easily booked with our secure online booking form. Simply enter your dates and click to proceed. 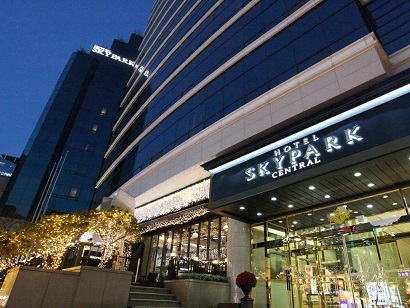 Situated in Myeong-dong, Hotel Skypark Central Myeongdong is the perfect place to experience Seoul and its surroundings. From here, guests can enjoy easy access to all that the lively city has to offer. For sightseeing options and local attractions, one need not look far as the hotel enjoys close proximity to Lotte Department Store Main, Myeongdong Art Center, Aesthe Shaiya. At Hotel Skypark Central Myeongdong, every effort is made to make guests feel comfortable. To do so, the hotel provides the best in services and amenities. A selection of top-class facilities such as free Wi-Fi in all rooms, 24-hour front desk, facilities for disabled guests, luggage storage, Wi-Fi in public areas can be enjoyed at the hotel. Guests can choose from 312 rooms, all of which exude an atmosphere of total peace and harmony. Besides, the hotel's host of recreational offerings ensures you have plenty to do during your stay. Whatever your reason for visiting Seoul, the Hotel Skypark Central Myeongdong is the perfect venue for an exhilarating and exciting break away. 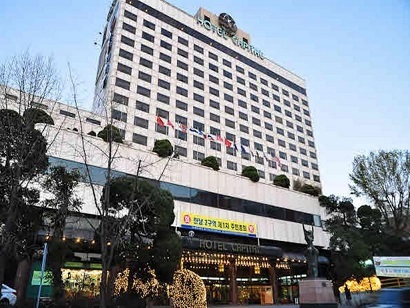 Conveniently located in the business and cultural hub of Seoul, Hill House Hotel is adjacent to the 'Embassy' district, where large corporations and government ministries are headquartered. As for transportation, it takes merely a few minutes to reach the Hyehyeon subway station and Seoul station. The area is within close proximity to popular shopping destinations such as the Lotte Department Store, Namdaemoon Market, Shinsege Department Store, and the Lottle Duty Free Shop. Rooms are comfortably fitted, coming in four different types and boasting a contemporary design. Each room is well-equipped with individual air conditioning control and a floor heating system to ensure a relaxing stay. With its commitment to service and focus on hospitality, you'll enjoy your stay at Hill House Hotel.